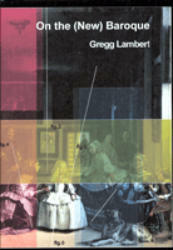 Title: On the (New) Baroque Author: Gregg Lambert Series: Critical Studies in the Humanities Imprint: The Davies Group, Publishers soft cover 274 pp. USD 26.00 ISBN 978-1-888570977 September 2001 A new revised edition of The Return of the Baroque in Modern Culture (2004) with appendix and author’s foreword. On the (New) Baroque explores the re-invention of the original European Baroque, primarily within the cultural, literary, and philosophical traditions of late-Modernism in Europe, the Caribbean, and Latin-America. In a highly original and compelling re-interpretation of modernity, Lambert argues that the frequency of the return of the baroque as a major category expresses an often hidden principle of postmodernism in its various national and cultural incarnations, a principle that challenges the historical centrality of the tradition of Anglo-American modernism. IIn this new paperback edition that will become more widely available to a North American audience, Lambert returns to add a new author’s forward, a coda on "New Baroque Construction," as well as an appendix on Argentinean writer Jorge-Luis Borges that appeared as a chapter in the author’s The Non-Philosophy of Gilles Deleuze (Continuum 2004). Other writers, philosophers, and critics examined in this study include Walter Benjamin, Paul de Man, Jacques Derrida, Eugenio d’Ors, Michel Foucault, Gerard Genette, Jose- Antonio Maravall, Octavio Paz, and Cuban writers Alejo Carpentier and Severo Sarduy. Contents Author’s Foreword to the 2008 Edition Author’s Foreword to the 2004 Edition Introduction: Why the Baroque? Part One: Major renovations of the Seventeenth-Century Concept 1 The Baroque Style: Heinrick Wölfflin, Frank Warnke, and Harold Segel 2 The Baroque Mechanism: José Antonio Maravall 3 The Baroque Eon: Eugenio d’Ors Part Two: Baroque and Modern 4 Baroque and anti-Baroque: Octavio Paz 5 Baroque and Modernity: Paul de Man 6 The Baroque Angel: Walter Benjamin Part Three: Baroque and Postmodern 7 A Baroque Thesis: Michel Foucault 8 Un récit baroque: Gérard Genette 9 The Baroque Emblem: Yury Lotman and Jacques Derrida Part Four: Baroque and Postcolonial 10 The Baroque Conspiracy: Jorge-Luis Borges 11 The Baroque and el neobarroco: Severo Sarduy 12 Concierto barroco: Alejo Carpentier Conclusion: One or many Baroques? CODA (2008): On the New Baroque Construction Appendix: The Baroque Detective (from The Non-Philosophy of Gilles Deleuze [Continuum Books 2004]) Notes Bibliography Index In his review of the Return of the Baroque in Modern Culture, originally published by Continuum Books in 2004, Professor Ronald Bogue of University of Georgia praised Lambert’s treatment as "an astute and highly original account of the Baroque and its echoes in modernity … that is sure to be the center of discussion in a number of fields for years to come." Author Gregg Lambert is Dean’s Professor of the Humanities and Founding Director of the Humanities Center at Syracuse University, New York. Among his many books and publications is Report to the Academy: On the (new) Conflict of the Faculties (2002), which also appears in The Critical Studies in the Humanities Series, The Davies Group, Publishers.